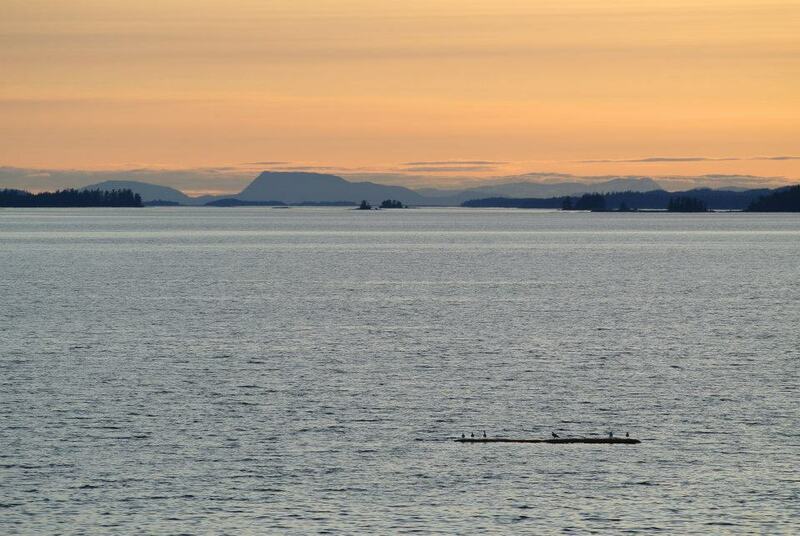 Above: View over southern Prince of Wales Island, from the M/V Columbia, in early 2012. I think the time has come for me to write a little bit about my time in Southeast Alaska. I lived in the town of Ketchikan for just over two years, and in that time I had some of the most memorable moments of my life. Some were good, some were bad. I like to say that it was the best worst two years of my life. I learned a lot about myself while I was there, and I grew immensely as a person and as a professional. 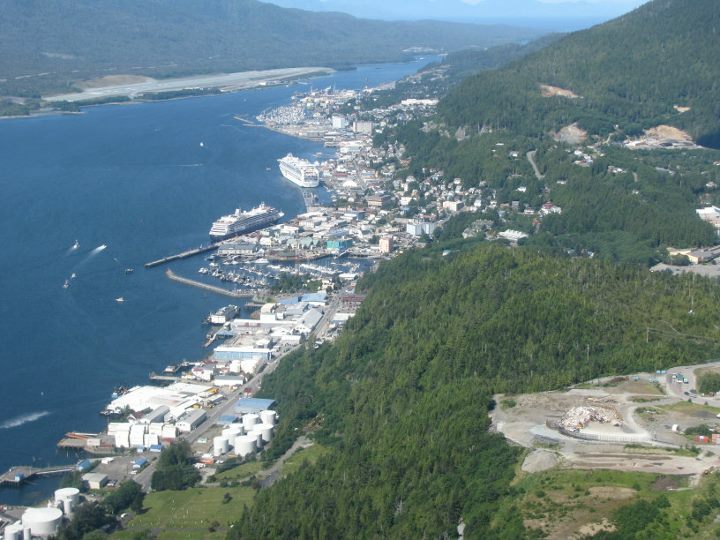 Above: Ketchikan, seen from the air, looking north up the Tongass Narrows on a rare sunny day. So where to start? I’d imagine that most people will need a primer on Ketchikan, and Southeast in general. A town of maybe 8,000 residents, Ketchikan is located at the southern tip of the Alaskan panhandle, sandwiched between the stormy waters of the Tongass Narrows and the densely forested, rocky shoulders of Revillagigedo Island. The shoreline rises rapidly from the water to the 3,000′ peak of Deer Mountain, and the town hugs the waterline, houses and businesses stacked one on top of another on the steep slopes. Cruise ships tower over the waterfront in the summer as tourists by the thousands wander the streets, snapping photos of eagles, seagulls, and totem poles. Despite its location on the edge of the wilderness, Ketchikan is the fifth-largest town in Alaska, and by some accounts it’s the most densely populated city in the state. It’s got a distinctly urban feel, in a remote, edge-of-the-civilized-world kind of way. Living here felt like living in an outpost on a border… here several cultures collide, and have combined to create a place that has an almost third-world feel to it at times. Winds roar up and down the narrow reaches of Clarence Strait at all times of the year, although October and November are the worst, and the rain falls in amounts that stagger the mind. The place averages close to 150 inches of rain a year, which is roughly twelve and a half feet of “liquid sunshine,” as the tourist brochures call it. The locals mostly ignore it, or complain about it like an unpleasant neighbor that plays his music too loudly on Friday nights and lets his dog poop on their lawns. My Seattle friends think they get a lot of rain, but the truth of the matter is that Ketchikan people go to Seattle for a chance to see the sun. I know I did. You can spot a Ketchikan resident by their walk; a sort of hunched-over hurried trudge, head down against the wind and rain, shoulders tight and pulled forward, scowl on the face, and raincoat buttoned tight. You could easily identify a tourist in a rainstorm, as they were the only people to try and use an umbrella. No self-respecting local used one. If they did it only lasted a few trips out in a typical Southeast storm. Umbrellas don’t work very well when the rain is coming sideways at you, and the wind has no respect for them in any case. You could also tell a local resident of Southeast Alaska by their choice of footwear: Xtratuf boots. Xtratufs were, and are, the appropriate choice of footwear for just about every activity in Southeast. Hiking in the muskegs? Yep. Going out fishing? Yep. School or office work? Yep, and yep. Out for a nice dinner at Oceanview or Cape Fox Lodge? You betcha! They even have a rainboot race where most people wear Xtratufs. The people who called Ketchikan home were an interesting mix of foresters, fishermen, aviators, artists, recluses, lawyers, drunks, and drug addicts. I don’t count the hundreds if not thousands of seasonal types brought in by the cruise companies to work in the tourist shops lining the docks, although they were an interesting bunch as well. Customer service was poor at best in most of the stores and businesses. It’s as if many of the people knew you had no other options, and made minimal effort to be good at their jobs. On the other hand, there was a distinct and unique sense of community, brought on I think by that same feeling that you were all there together, stuck with limited options for entertainment, restaurants, and social activities. I rapidly found out that if you were still in town after the tourist season ended, people became much friendlier, as they knew you were a local as well. People I’d seen in the shops all summer, and who never looked at me twice would now strike up a conversation as I went through the checkout line at the grocery store. I also discovered that the artistic community of the island was quite small, and I’d hear many of my coworkers on the local public radio station in the evenings and on the weekends. The Forest Service was a large part of the community for a lot of reasons. They employed a lot of people directly, and indirectly supported the local aviation businesses, the local fishermen, the loggers, and the outfitters. In a place where 95% of the land base is publicly owned, the agency that manages that land will constantly be the subject of discussion and scrutiny, and will always be a part of the local culture and economy. Which brings me to another point. The Tongass NF is the largest single unit in the National Forest system, with a land area the size of West Virginia. Of course, being made up of many islands, the actual area in which those 17 million acres sit is even larger than that. Even in an airplane or helicopter it would take several hours to fly from one end of the Forest to the other. In general terms, the distance between Yakutat in the north end of the Forest, and Ketchikan in the south, is roughly equivalent to the distance between Glacier and Yellowstone National Parks in Montana and Wyoming. Distance plays an important role in any discussion about Southeast. Transportation in the region was unique. Ketchikan is of course on an island, and the airport is awkwardly located on yet another island, albeit one that’s separated from town by only a few hundred yards worth of saltwater. To the north and south you had roughly twenty miles of road in either direction, running along the coastline in both cases. To the interior you had a few Forest roads that were open to the public, and a vast network of private timber roads that were not. If you wanted to visit another island you had few choices. There was a local ferry that ran to Prince of Wales, and the Alaska Marine Highway serviced the other communities of Southeast, and served as a primary means of getting around if you wanted to take a car or truck anywhere. Most of the time I flew where I was going, including trips to Seattle and Missoula to visit family. Alaska Airlines had daily flights through Ketchikan year-round, three going north and three going south, with a few additional flights in the summer to facilitate the comings and goings of tourists and fishermen. If you needed to go somewhere that the airline didn’t service, you flew via one of the small air taxi companies, or you took a plane or small boat of your own. The difficulties in getting around meant that you either got very good at traveling, or you just didn’t get out much. There were many people who made the run down to Seattle every month or so for a dose of culture or a sporting event, some good dining, or just for a shopping trip. There were also many who left town rarely, feeling that they could get everything they needed in Ketchikan or through the mail, and that there was no need to spend time and money to travel somewhere they likely wouldn’t enjoy anyway. Southeast Alaska, like many of the rural places I’ve lived, has its share of residents who are there precisely because it’s short on people and culture, and long on wildness.